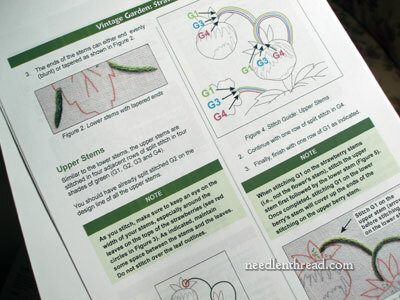 Margaret Cobleigh will be hosting an online class here on Needle ‘n Thread in the coming weeks. The class project is called Vintage Strawberries. It’s a beautiful little needlepainting project for stitchers who have at least some experience with stitching, though not necessarily with needlepainting. The class will run for three weeks on the Ask & Share forum here on Needle ‘n Thread. The class takes place in a forum setting (you can explore the Ask & Share a little to see what it’s like if you wish) and is interactive – you’ll have the opportunity to “chat” with fellow classmates, to get feedback directly from the instructor, to post your own photos for feedback or fun. You’ll also have the option of communicating with the instructor via e-mail, if you prefer. With the class, you’ll receive a full kit of materials, which includes a full-color printed instruction booklet with step-by-step photos for completing the project, the design pre-printed on a linen-cotton blend fabric, full skeins of DMC floss in the 11 colors required to complete the project (which gives you enough floss to complete it approximately three times), and Bohin needles. You’ll need to provide a hoop or frame, good lighting (and magnifier, if necessary), and scissors. Margaret’s step-by-step instructions are extremely thorough and clear – among the best I’ve seen. This is an excellent way to learn the techniques of realistic shading with needle and thread, and you’ll have the instructor on stand-by to help you throughout the class. Online classes are a fun and affordable way to explore embroidery techniques. They offer the opportunity of interaction with other embroidery enthusiasts as well as one-on-one contact with an instructor who will help you through any tough spots and provide feedback so that you can improve your needlework skills. When the instructor replies to your questions in the classes here on Needle ‘n Thread, the replies are one-on-one. Attention is not split between 20 other people in the class or other environmental distractions that you might find in a workshop classroom. You can ask your question, and the instructor will reply to you with a specific, tailored response that gives you the further feedback and help you need, in writing. You can refer to the responses to your questions as often as you need to. One of the best advantages of an online class, considering the general busy-ness of our lives, is that you don’t have to take a chunk of time away from work or family obligations to participate in them. They are self-paced. You choose the best time for you to stitch. The most obvious advantage of an online class is that they are affordable. Cost-wise, they are a fraction of the much more expensive, “real life” workshops – no facility fees, no travel expenses (airline tickets, gas, hotels, meals out). The instructor’s fees in an online class are generally much lower than the daily fee for a workshop. In an online class, you avoid the most expensive aspects of a workshop. 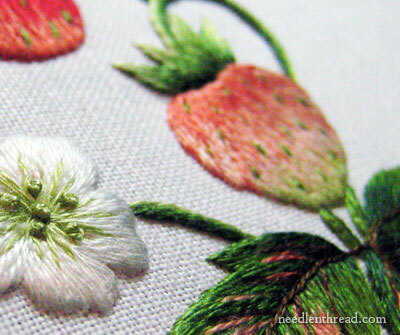 Vintage Strawberries is recommended for embroiderers with at least basic experience in stitching, though experience in needlepainting is not required. The class registration for Vintage Strawberries opens Friday, June 29, with an announcement here on Needle ‘n Thread. You can look for the announcement and links for registering for the class to be posted here at 9:30 am Central time (Kansas, USA), so if you’re keen to sign up, you can figure the time difference for your location and keep an eye out. The class is limited in enrollment and spaces are offered on a first-come, first-served basis. The registration announcement will include the cost of the class along with further details pertinent to this particular class on Needle ‘n Thread. Time tables and methods of instruction and communication may vary slightly from instructor to instructor, so you’ll want to read the registration announcement thoroughly before signing up! 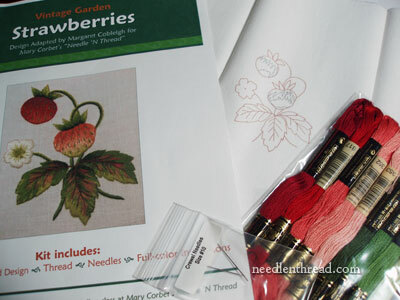 So – if you’re keen to learn needlepainting (and if you love strawberries) – look for registration to open this Friday! Gostaria de saber o preço…. I would like to know the price …. Lovely! I *want* to do it! Do you already know when the course will run? I would love to do this class but unfortunately I’m already committed to 2 projects at the moment. Do you know if Margaret will run the course again? Mary are you going to be organising any future online courses would love to participate? Thanks for your reply, can’t wait for your online class in anticipation!!!!!!!!!!!!!!!!! Mary, this is wonderful class! Hi, Masha – All the details regarding price and calendar dates will be posted on Friday, when registration opens. Hi Mary, Knowing how I learned from the Nesting Place course, jumping in with two feet in an online course is the way to go for me. I hope classmates from NNP2 show up too. Thank you for organizing the class and I look forward to the monogramming class as well. Hope summer in Kansas is treating you well. I am eager to sign up as well Kathy! Would it be possible to purchase just the kit at some point? I will be on vacation during the class, with no access to internet, but would love to stitch those berries! Hi Mary Lou, as Mary said the kits are only available to class participants and there are currently no plans to offer them for sale outside of the class. Even though you will be on vacation during the class, once the the class concludes the class forum will still be available to students. Also, I will be available for questions after the class is over. I would be happy to help you with the project. This is great, I’m hoping to be able to join. You mentioned that the course will start July 13 but unfortunately I’m away until the 15. Would I still be able to participate? I really hope that I can. Hi, Paola – the vintage strawberries are not available as a kit, to my knowledge. They were available for the class, which was actually five years ago. Sorry about that!